Cheap Bank Holiday Outings for the Family - What Will You Do This Weekend? Since hubby-dearest is away at the moment (long story), I've been trying to organize some fun yet frugal activities for the kids and I this Bank Holiday weekend. Money is a little tighter than usual (being the week when most of our household bills get paid) so I've been brainstorming some free and very cheap days out which we can all enjoy together. Each Saturday at 10am, Cineworld presents "Movies for Juniors" - a selection of fairly recent films for the kids with tickets at just £1 each, even for any adults who attent. This weekend, the films on offer are Madagascar 2, Escape to Moonacre and Beverly Hills Chihuahua (I'm hoping we can settle on Escape to Moonacre, but we'll see what the kids vote for). Visitors should also be able to buy a kids snack box for around £3.10 which includes popcorn, sweets and a drink. Be sure to ask for this as it's not usually on the price boards, and the cheapest alternative popcorn starts from around £3.95! You can book online/by telephone but there is a charge of 60p each ticket. If you can, it's better to visit the cinema in advance and buy tickets as on the day the queues are huge and unless you're early you can't always guarantee a seat. We regularly visit the Old Coates car boot sale, which is about 30 minutes drive from where we live (and is among the largest in the region). I love visiting these sales as we always seem to find something great for the house. I wrote about this some time ago if you're interested to look. 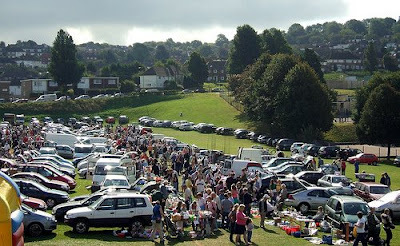 or you could visit Car Boot Junction to find a sale close to where you live. This week, we're hoping to buy some established plants for our developing garden, particularly any vegetables that we haven't already grown from seed, and perhaps a small bench for the kids (provided we have room in the car to hold it!). I know the kids will not come home empty handed - they always find something of interest, which is why a pocketful of loose change comes in handy. And when haggling over 10p, it's hardly fair to hand over a ten pound note! On Monday (good weather permitting) we're going to have a picnic in the park. We've not yet chosen which particular park to visit, but chances are we'll visit the large "country park" on the outskirts of town, which offers a beautiful walk around a man-made lake. For added enjoyment, the kids will help me make a batch of muffins to take with us the evening before. It's always a messy experience, but I love to watch their faces as the soggy dough transforms into delicious risen dessert. Which frugal activities do you enjoy with your family? We're all experiencing the effects fo the credit crunch this year, so with little (or no) money to spend, what activities will you enjoy with your children this spring? A little closer to the main summer holidays, I'm hoping to write a feature-length article of fantastic low-cost activities for the kids, so please feel free to offer your ideas and I'll be sure to credit you if I use your idea for my article. 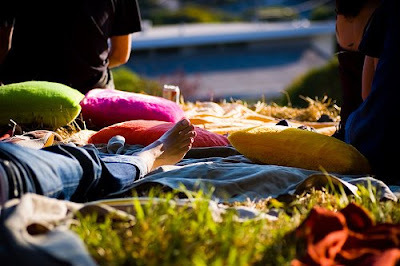 Image credits: Boy playing on balls by Pink Sherbert Photography; Car Boot Sale by Dominic's Pics; Picnic by Stewart. All via Flickr Creative Commons.